We’ve had some feedback from Members concerned about their Profile information being visible to non-members browsing our website, and information showing up in Google searches. This issue is easily solved by watching this video tutorial on how to change your Privacy settings in your own Profile. Basically, you just go to Edit your Profile, and you’ll notice on most of the fields there is a “Visibility” button. Just click this button, and choose from the options: Public, Only Me, or Members Only. The best setting is Members Only to ensure other registered Members can see all your relevant information. The Name field is set to Public by default and this cannot be changed. 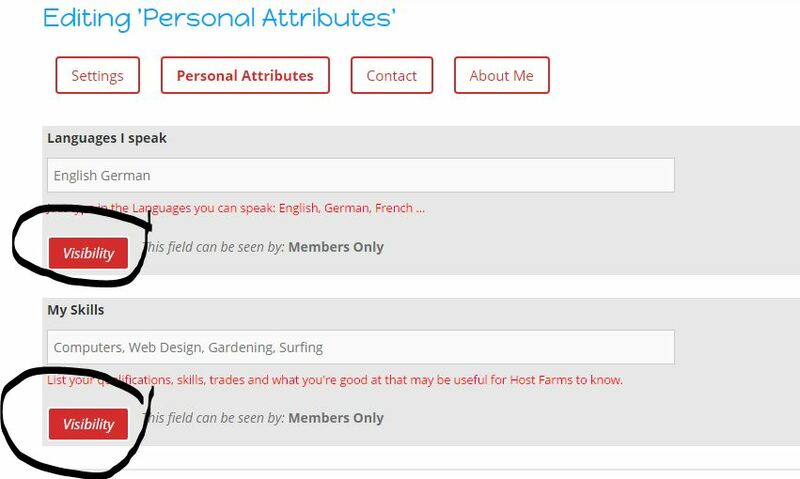 WWOOF members must include their full name in their Profile, but it can be in another field that is set to members only if prefferred. Watch this short video to quickly learn how to do it.